An Illinois State student works on an art project. Not everyone’s college experience is the same, nor should it be. Your student has unique talents and interests, and his or her college experience should foster them. For nearly every talent there is an on-campus community, so encourage your student to explore the diversity of opportunities for engaging those interests at the college he or she is considering. Does your student love to create music? Or perform on stage? Or use their hands to produce art? Regardless of the level of interest and commitment, there are outlets for that passion, even without having to commit to focusing academic studies on that pursuit. “Continuing in the fine arts offers students an opportunity to develop common-minded social networks, and arts education develops creativity—a valuable attribute to employers,” Assistant Dean of Academic Programs and Student Affairs in the College of Fine Arts Janet Tulley said. 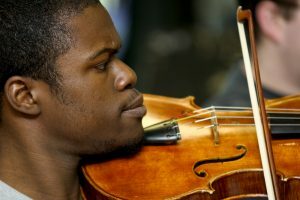 Artistically-inclined students have a wealth of resources on campus to pursue interests in music, art, dance, or theatre. Non-majors can scratch the artistic itch by taking a class in drawing, dance, or theatre production. Not only is it a fulfilling opportunity for enrichment, it also helps fulfill elective credit-hour requirements. Does your student feel the draw of the stage? Whether it’s the marching band, a choir, or a performing dance group, encourage your student to explore what options are open to non-majors if he or she isn’t ready to hang up his or her performing shoes just yet. No matter where your student’s passions may lie, there are others out there who share them. Many campuses feature student organizations for different types of dance, photography, or even novel writing—offering an opportunity to meet new people and build relationships. There are also plenty of opportunities to learn from and enjoy the art of others. A college campus provides a wealth of opportunities to attend art showings, watch live music, or check out dance and theatre performances. One of the best parts of pursuing unique interests and talents is meeting others who share those passions. Illinois State fosters those communities with the opportunity to live in Themed Living-Learning Communities on campus. Maybe your student is gifted—and fortunate—enough to play intercollegiate sports, but for the majority of athletes, the desire to remain involved in sports has to find other outlets at the college level. There are, however, plenty of options. Club sports are organized groups that vary in competitiveness depending on the specific club. Some groups are highly competitive and require tryouts; others focus more on promoting an athletic pursuit and competing recreationally. Many compete against other schools and are a great way to remain active in an organized way. 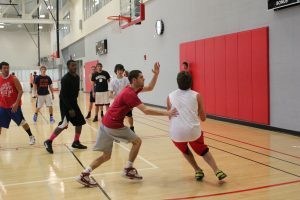 Illinois State students take advantage of opportunities to play sports by playing basketball at the student recreation and fitness center. The intramural level is focused on recreational competition, though some offerings may vary in the fierceness of competition and feature everyone from high school star athletes who didn’t pursue athletics in college to students who are trying out a sport for the first time. Most schools hold a variety of offerings in both league and tournament formats, and leave it up to the students to self-organize teams and register for the competitions. Most colleges feature student fitness and recreation centers with top-of-the-line equipment and access to features like rock-climbing walls, racquet ball courts, swimming pools, and personal trainers. It’s a great way for your student to stay active and healthy. Sometimes it’s nice to sit back and watch others do the work. College sports offer unique environments and high passion, and are a great way to stay involved in the sports community and stay plugged in to campus. Is your student looking for an opportunity to think differently about things? Illinois State’s Honors program is designed to think without boundaries and find a community of like-minded students. Does your student excel in the classroom or like thinking about things differently? College is a great place to expand horizons, and there are options for students who want to pursue exceptional learning. 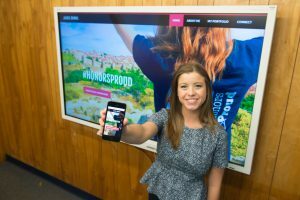 An honors program can be a great way for high-achieving students to add an additional layer of the learning experience at the college level. The honors environment builds a community of students interested in expanding their learning experience. In many cases, students can work closely with professors and other university faculty to investigate academic interests. An honors program can be a great way for a student to intellectually challenge themselves and explore academic interests more deeply. Be sure to investigate the honors program at each school your student is interested in. Every university shapes its honors offerings differently, and each has different requirements to earn and maintain eligibility for the program. Also, remember student organizations aren’t only for entertainment. There is a bevy of groups looking to advance intellectual ideas or career goals. Look for organizations that focus on your student’s area of study—the chemistry club, for example—as well as those that center on building leadership skills and give your student a place to develop those skills in a supportive environment. Other organizations are philanthropic in nature, providing students a way to set service goals and help the community locally and globally. “A buzzword we always talk about is leadership, and this is a concrete way to showcase that: work within or build a student organization around a cause,” Registered Student Organization Specialist Amy Miller said. No matter where your student’s interests lie, pursuing individual passions and gifts beyond his or her main academic focus sets up your student for self-discovery and fulfillment—important building blocks for a successful future beyond a college campus. Illinois State University has a plethora of opportunities for your student to engage his or her interests and skills. Check out some of the aspects of student life as a Redbird! Related Article: Gift ideas students can actually use at college Let’s face it, who doesn’t like getting gifts? But there’s no sense in spending money or time on things your student will already have or never use. We offer some useful ideas.